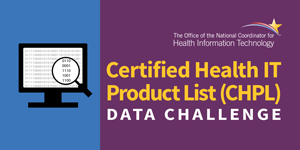 The U.S. Department of Health and Humans Services’ Office of the National Coordinator for Health Information Technology (ONC) today announced the winners of the Certified Health IT Product List (CHPL) Data Challenge . ResearchAE . ResearchAE is a search engine for health and health IT datasets. They produced an application mapping CHPL’s API with meaningful use attestation, the Medicare Provider Enrollment, Chain, and Ownership System (PECOS), and National Plan and Provider Enumeration System (NPPES) data. Users are able to perform cross-sectional searches allowing users to analyze who is using ONC certified health IT and how it’s being used. The award for the winning submission is $20,000. Shiro Labs . Shiro Labs created a web-based application that combines Medicare Quality Payment Program (QPP) data with CHPL data, allowing providers to better understand how ONC certified health IT complements their QPP reporting requirements. The runner up submission is awarded $10,000. Darena Solutions . Darena Solutions, developers of MyMipsScore (https://www.mymipsscore.com/ ), created a mobile application, called CheckEHR. The interactive program allows users to view where certified health IT modules have the certification criteria to meet several healthcare delivery and quality goals, such as care coordination and patient engagement. The runner up submission is awarded $10,000. Winners Webinar held on Thursday, January 10, 2019. Informational Webinar Held on August 1, 2018. The ONC CHPL is the authoritative, comprehensive listing of all health IT products that have been tested and certified under the ONC Health IT Certification Program. Health IT products are listed on the CHPL after eligible components have been successfully tested by an ONC Authorized Testing Laboratory (ONC-ATL) and certified by an ONC Authorized Certification Body (ONC-ACB). The CHPL contains data on certified health IT that includes information on certification criteria to which the health IT has been certified, usability testing results, and surveillance activities, including any non-conformities to their corrective action plans/resolution. In the past, much of the data on testing and certification was provided in unstructured documents, making data analytics a more involved effort. In 2016, ONC changed the CHPL’s design in order to allow users of the CHPL to have better access to the data in structured, discrete formats. All the data is viewable directly on the CHPL website. For users who want greater access to the data, the CHPL has APls and downloadable XML files containing the complete data available. Please note that only the 2015 Edition of certified health IT products would have complete discrete data available in these structured formats. Structured data for the 2014 Edition is limited. Further details about the CHPL can be found in the CHPL User Guide. Instructions for how to use the CHPL data APls can be found here. Downloadable XML files and their documentation can be found here. Further refine and clearly identify the sub-set audience category for the software application. For example, if the end-users are health care providers, then it must be specific which type of providers (e.g. primary care, specialist, long-term care, behavioral health, etc.). Functionality/Accuracy: A software application may be disqualified if it fails to function as expressed in the description provided, or if it’s determined to be inaccurate or incomplete information. Security: the software application must be free of malware. The applicant agrees that ONC may conduct testing on the software application to determine whether malware or other security threats may be present. ONC may disqualify the submission if, in ONC’s judgment, it may damage government or others’ equipment or operating environment. Use of additional data platforms and sources beyond the CHPL, with emphasis on publicly available data, are encouraged, but not required. The software application may be integrated into an existing web, mobile, voice, electronic health record, or other platform for supporting interactions of the content provided with other capabilities. Examples include query-based prompts that generate messages, visualization methods that graphically display messages, delivery of information with other platforms with calendar functions, and uses of gaming approaches aimed at enhancing consumer actions, among others. Eligible challenge submissions will be reviewed by a panel composed of federal employees and experts in compliance with the requirements of 15 U.S.C. 3719 and the Department of Health and Human Services judging guidelines: http://www.hhs.gov/idealab/wp-content/uploads/2014/04/HHS-COMPETITION-JUDGING-GUIDELINES.pdf. The review panel will make selections based upon the criteria outlined above. To enter this challenge, submitters can go to the Submission Form. Slide deck of no more than seven slides that describes how the solution functions and addresses the application. Video demo (5-minute maximum) demonstrating use of the solution. Note: ONC may request select submitters to perform a live webinar demo at ONC’s discretion. Each entrant retains title and full ownership in and to their submission. Entrants expressly reserve all intellectual property rights not expressly granted under this notice. By participating in the challenge, each entrant hereby irrevocably grants to ONC a limited, non-exclusive, royalty-free, worldwide license and right to reproduce, publicly perform, publicly display, and use the submission, including the software application, to the extent necessary to administer the challenge, and to publicly perform and publicly display the submission, including, without limitation, for advertising and promotional purposes relating to the challenge. If the submission includes any third party works (such as third-party content), Participant must be able to provide, upon request, documentation of all appropriate licenses and releases for such third party works. If Participant cannot provide documentation of all required licenses and releases, ONC reserves the right, at its sole discretion, to disqualify the applicable submission. Participants must indemnify, defend, and hold harmless the Federal Government from and against all third-party claims, actions, or proceedings of any kind and from any and all damages, liabilities, costs, and expenses relating to or arising from Participant’s submission or any breach or alleged breach of any of the representations, warranties, and covenants of Participant hereunder. ONC reserves the right to disqualify any submission that, in their discretion, deems to violate these Official Rules, Terms & Conditions.